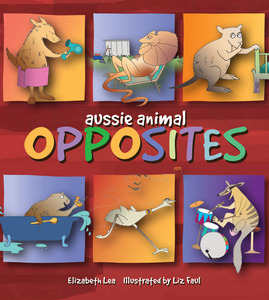 Using vividly coloured images of native animals, this sturdy board book displays actions that children will identify with as they are introduced to adjectives and their antonyms. It’s an excellent tool to help expand vocabulary in a fun way. I particularly like ‘quiet quokka’ with a finger to her lips, hovering over her baby in its cot and then, on the opposite page, ‘noisy numbat’ bashing drums. This effectively instills opposite emotions in readers. Besides the commonly used emu, koala, dingo, wombat, goanna, crocodile, bandicoot and numbat, this production also displays our yabby, owl, frog, seal, quokka, honeyeater, mole, lizard, lorikeet, heron, cassowary, ant, snake, rat, turtle, and mouse. I found it refreshing to see such a wide range of species acknowledged and was pleased that ‘calm cassowary’ was not at all perturbed by ‘angry ant’. Ant was rather red with wrath too! As ‘energetic emu’ heads for the finish line in a race, ‘lazy lizard’ lounges on a deck chair near the backyard shed. Toys are packed away by ‘tidy turtle’ but ‘messy mouse’ has spilled his breakfast. A sand castle is kicked over by ‘mean mole’ while ‘kind koala’ helps baby put a band aid on its grazed knee. 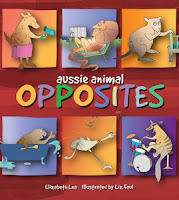 Clever use of everyday situations ensures young readers will easily understand the words. The back of the book also includes a selection of images from the National Library of Australia’s own collection. Below each image are facts about each animal and suggested activities that will expand on the reading, ensuring the book is not quickly outgrown.